Sangha night provides inspiration, guidance and support by bringing consciousness to the connections between our inner and outer lives. The heart is said to be the meeting point between our inner and outer worlds. This year Sangha night is consciously travelling into this often veiled territory of the heart where our worlds meet. Sangharakshita stressed the centrality of Going for Refuge to the Three Jewels (Buddha, Dharma, Sangha,) as the basis for a well led human life. For this reason our year of Awakening the Heart is focusing on the three refuges. We will be seeking inspiration and guidance from the exemplary Jewel of the Buddha’s life, to engage and enliven the heart. We will be exploring the Dharma Jewel that frees and resources a responsive heart, and the Sangha Jewel that establishes supportive and inspiring ground from which we can step deeper into our own life; our own heart, and from there meet the suffering world. 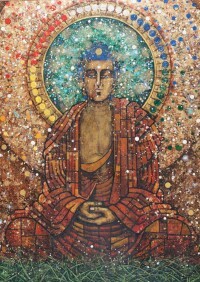 This Spring the exemplary life of the Buddha will be opening out the resonances between awareness, imagination, the heart and empathic connection.